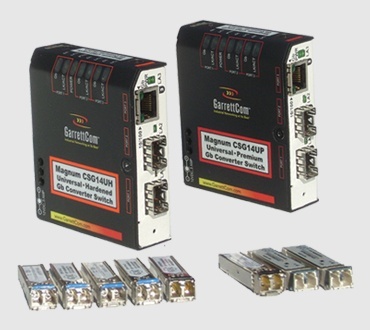 SFP fiber transceiver technology has been integrated into the Magnum Gigabit Converter Switch package to produce the Magnum CSG14U Universal Converter Switch. It can handle any Gb fiber type – multi-mode and single-mode – and fiber media distance with a selection of Gb SFP fiber transceivers, up to two of which can be plugged in. It can also handle any 100Mb fiber media type and distance in the same way, with a selection of 100Mb SFP fiber transceivers that similarly plug in. And, for copper media attachment, there is a 10/100/1000 auto-negotiating RJ-45 port. The CSG14U is a high-speed flexible edge-of-the-network industrial Ethernet product. 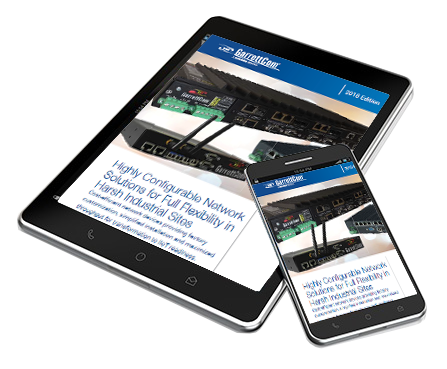 The compact package is ideal for industrial network edge installations. It features 12V, 24V or 48V DC power input terminal blocks, or AC input via industrial-grade external power supplies. It has the metal case and DIN-Rail or panel-mounting choices you expect from Magnum industrial grade products.